Residents of Studenytsia village in Zhytomyr oblast now have better access to healthcare thanks to energy efficiency upgrades and renovations in the local ambulatory care clinic. Presented to media within the context of European Sustainable Energy Week on June 24, the initiative was inspired and partially financed by the Community-Based Approach to Local Development (CBA), a programme funded by the EU and run by UNDP. The programme covered half of the cost of the project while the community and local authorities collected the other half. “It is a small project but it has a big value,” says Walter Tretton, the head of the EU Delegation’s infrastructure and transport section, commending the initiative’s success. He adds that the EU would like to see these micro-projects implemented across Ukraine become “models for other villages” in the country. The two-phase initiative in Studenytsia began with improving energy efficiency in the local ambulatory. It installed energy saving windows and coal boilers, helping the building to save money previously spent on expensive gas. “Before, 15% of the ambulatory’s budget – about UAH 80,000-100,000 annually (ca. € 7,000-9,000) – was spent on energy,” says Anatoliy Kryvopanchuk, its chief doctor. Now the coal boiler has decreased energy spending to just UAH 20,000 per year. In three years, savings reached more than UAH 150,000 (more than €13,600), matching the community and local administration’s contribution to the initiative. After a successful energy saving upgrade, the project repaired the ambulatory’s roof and purchased dental and physiotherapy equipment. In both phases the CBA initiative covered 50% of the costs (about UAH 150,000 or €13,600) while 5% of the funding was collected by residents themselves (almost UAH 15,000), and the remaining 45% was provided by the local authorities, says Denys Poltavets, the CBA project’s community development specialist. Thanks to the local NGO, “Dovira-1” (“Trust-1”), created in 2008, village residents were collaborating on projects even before beginning the CBA project, reminds Valentyna Radkevych, the NGO’s leader. After the project’s launch, they debated which areas should be addressed as a matter of priority. Despite many other local problems, residents considered public health the most urgent topic, explaining the decision to focus on the ambulatory. The renovations were completed within a year, and the NGO is now preparing new proposals for different donors, including programmes funded by EU Member States, Radkevych adds. One of the goals of the CBA micro-projects is to disseminate these energy saving experiences across Ukraine. Indeed, the money saved on energy can be put to better use for the benefit of people, as the Studenytsia experience confirms. In total, over 1,100 Ukrainian communities and 1.2 million citizens have benefited from the EU-UNDP Community Based Approach to Local Development Programme since its launch in 2007. With a total budget of €30 million, it has rebuilt health centres, installed street lighting, provided school buses, replaced windows in schools and hospitals, and ensured a supply of clean water. This has all been done with the support of organised local community groups, using social mobilisation tools to bring together local communities and local authorities for joint decision-making, cost sharing, implementation of community projects, and the establishment of sustainable and transparent mechanisms of local governance. 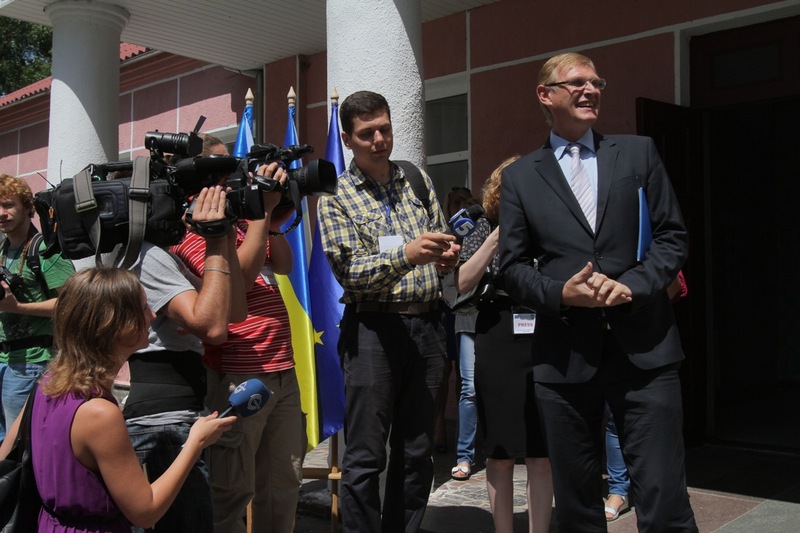 ← EUBAM announced a competition for journalists ‘Border and reforms’.